A Day in the Canyons with Excursions of Escalante! I like to get to the point quickly, so I am not going to waste words here.... I just have to say that Rick at Excursions of Escalante is one awesome guide!! 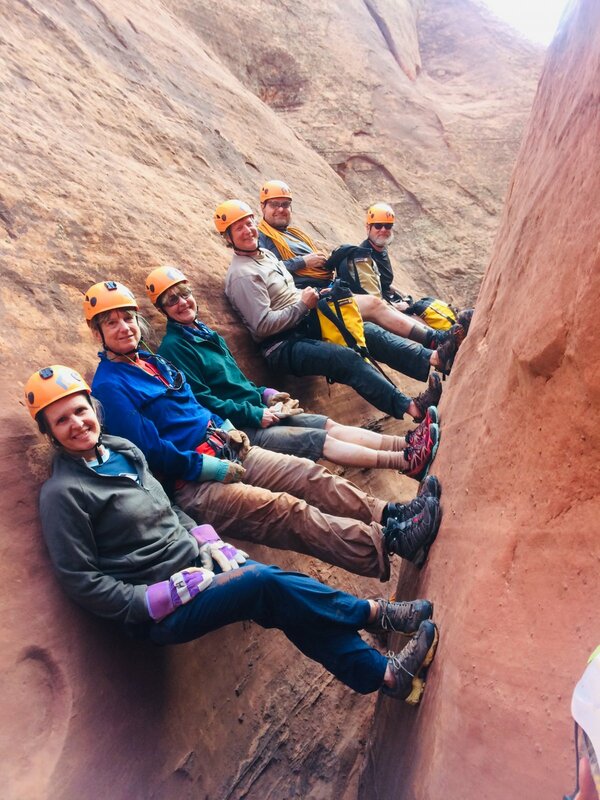 He takes time to get to know each person in the group, he teaches teamwork that makes all the difference in the canyons, he's patient with all ages, he's funny, and he knows which slot canyons is right for you. He's Mr. Safety First, with candy in his pocket for those with low blood sugar, and he's an expert who's been saving lives in the canyons for years. We highly recommend that while staying here at Canyons Bed & Breakfast for a few days, that you cross the street to meet Rick and his lovely wife Amie, who will be packing a fine lunch for your big adventure! Some things to consider: You will need some real shoes (no sandals of any kind) with good traction, and clothes that can possibly get ripped or stained with red mud. If you don't have these things, Amie will send you down the street to the thrift store, so be prepared and no short-shorts! Just bring your sunscreen and camera. Everything else is provided. Groups often meet at 8:00 in the morning and return around 4:00, but each trip can be customized to meet the needs of your group. Be ready for an amazing day of awesome views, twisted canyons that really do require a guide to find your way, possible rapelling, and be prepared to learn fun new skills to make it possible to get past the tough spots. This will be a day you will never forget!